It is in this way that the unquestionable authority, the British Encyclopaedia, qualifies Calabria liquorice. 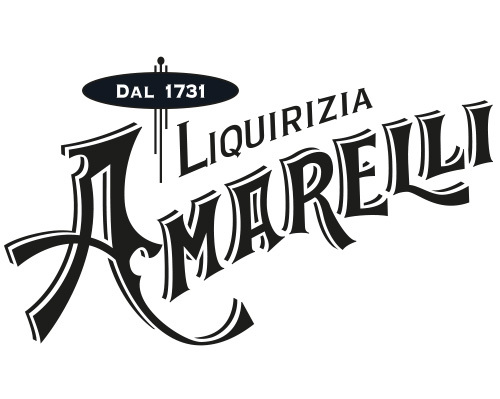 The history of this liquorice, which dates back over a thousand years, is closely linked to that of the Amarelli family, known as one of the oldest Houses on this market. An elixir of longevity in Chinese medicine and according to Hippocrates, this root with a characteristic bitter-sweet taste, and vivifying, digestive and throat-soothing virtues, has been harvested since antiquity on the Calabria Ionian coast, where it grows naturally. Thus, a stone mould from the 18th century is still being used, the fuel which supplies the boiler is olive marc, which is very environmentally-friendly. Today, the sap is now drawn using a very modern tool and all production cycles are computerised to optimise yield and safety, but the concentration, ending phase of the production, is still done under the supervision of the "master liquorice maker". The final product is very high quality pure liquorice which is completely natural, without additives or sweeteners, with a very pleasant taste and a particular savour. Simply seeing beautiful black, shiny, smooth liquorice awakens childhood memories when we would buy these delicious sweets after school as wooden sticks or small pieces of liquorice, either plain or flavoured with mint, anise, orange or violet. Today, Amarelli liquorice is still presented in the famous little tins, decorated with old pictures from the House collection. Typical of the South and a symbol of an Italian art of living, this liquorice is famous throughout Europe, in the United States and even in Australia. The "Giorgio Amarelli" Liquorice Museum, at the ground floor of the family palace, presents old agricultural tools, a collection of women's, men's and children's clothing reminder of the familial origin of the company, equipment and machines used in the making of the liquorice, historical documents, old images and commercial advertising. The testimony of the industrial activity of the family and the region gathered in this Museum constitute an invitation to discover the life and work of several centuries and which asks only to be continued for a long time to come. 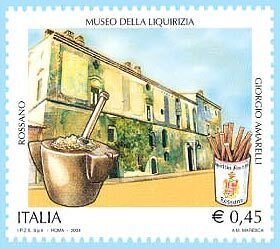 To honour the Amarelli Museum, the Italian Post Office has created, in the collection dedicated to the Italian Cultural and Artistic heritage, a stamp devoted to the “Giorgio Amarelli” Museum which has been printed at 3,500,000 copies. The Amarelli arrived from the north before the year 1000 and rapidly founded a vast domain in Calabria, by uniting a large number of large latifundia. During the same period, they received the title of barons for military exploits. In 1469, the family obtained the privilege of adding the coat of arms of the Aragon Kings to their own. In Rossano, the shield on the door of the oldest family palace and that on a Cathedral alter bear witness to this privilege. During this period, the Amarelli began building a fortress to defend themselves from their enemies and to protect the centre of their various activities, notably agricultural activities. 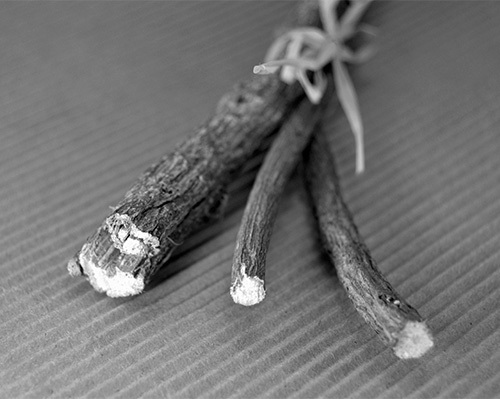 Around 1500, the Amarelli, as well as all the large land owners, began the first harvest and sales of liquorice root on their estates, in order to improve their land by letting it lie fallow before planting. When Paolo Amarelli died at the age of 104, his son Fortunato and his grandson Paolo Fortunato created a "concio", one of the first pre-industrial organisations. The Amarelli company was thus born. Like today, sticks and drops were already being produced from liquorice transformed from sap drawn from the roots and concentrated over a fire. The enterprise continued to develop from father to son: in 1840, Domenico Amarelli opened a branch in Naples, the capital of Royalty and the second major European city after Paris. In 2013, 170 years after we opened a showroom in Naples. In 1907, Nicola Amarelli innovated by installing two steam boilers, the technical performances of which were presented in the Naples Agrarian Revue, and the products, increasingly well appreciated on foreign markets, received numerous awards. In the 1970's, Giuseppe Amarelli gave the family enterprise a tremendous boost, under the impetus of his son Giorgio - who was to die very young in 1986. In 1987, the enterprise won the Gold Medal from the Italian Chemical Company for having succeeded in uniting the excellence of the traditional craftsmanship of Amarelli products with the latest technology. In 2001, the Amarelli have inaugurated the "Giorgio Amarelli" Liquorice Museum which was awarded the Guggenheim Enterprise & Culture Trophy. The Archives of the family was declared of historical interest by the Italian Ministry of Culture.